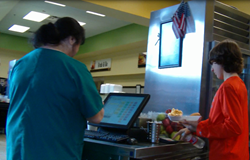 The Solana point of sale system gets students through the lunch line quickly. The review team was impressed with the POS system and the speed and ease of use that it offered. The school nutrition program in Calhoun City Schools, GA was the first to undergo a state administrative review while using the newest point of sale system available in the school nutrition market, Solana, from Horizon Software. With heightened scrutiny of the National School Lunch and Breakfast programs and focus on accountability of the federal program dollars, the accuracy of data captured and reported is crucial to a district’s image and operations. The audit at Calhoun City Schools, a five-site district with an enrollment of 4,100 students, concluded in late January and included a comprehensive review of cashier and manager procedures for selling reimbursable meals at the point of sale. “The review team was impressed with the POS system and the speed and ease of use that it offered.” Additionally, over 500 applications processed by Solana to determine student eligibility for free and reduced-price meals were reviewed, with not a single error found. Solana offers school nutrition programs an easy-to-use cloud-based system to capture and report the data required for meal program accountability, including a lightning-fast POS, student eligibility management, and real-time reporting center. It integrates seamlessly with the MyPaymentsPlus online payment system for student meal account payments, as well as most Student Information Systems. For additional information or a demonstration, please visit http://www.horizonsoftware.com/solana or contact Horizon Software at (800) 741-7100. Operating as a unit of Roper Technologies (ROP: NYSE), Horizon is a Microsoft Gold Independent Software Vendor headquartered in Duluth, GA. Horizon’s software for school nutrition programs and online payments is installed in over 11,000 schools across the United States and more than two million users take advantage of Horizon’s technology. For more information, visit http://www.horizonsoftware.com or call toll free (800) 741-7100.